NASA Probe Reaches Orbit Around Dwarf Planet : The Two-Way NASA's Dawn mission has reached its destination and is orbiting the dwarf planet Ceres. It's the end of an odyssey to explore an odd, in-between world. Astronomers have known about Ceres for centuries, but they don't really know what to make of it. This morning, a plucky NASA spacecraft has entered the orbit of one of the oddest little worlds in our solar system. Ceres is round like a planet, but really small. Its total surface would cover just a third of the United States. Scientists have had a tough time figuring out what to make of Ceres. Right after it was discovered, Ceres was believed to be a missing planet they were looking for. But then astronomers noticed chunks of rock and ice orbiting in the same region. Ceres, it turns out, was actually in the middle of what we now call the asteroid belt. "And so then Ceres was referred to as an asteroid," Raymond says. It stayed that way until 2006, when the International Astronomical Union redesignated Ceres (and more controversially Pluto) as dwarf planets. Ceres got the title because it's bigger and rounder than any asteroid. Personally, Raymond still likes to think of Ceres as a planet, but she admits it occupies a funny sort of in-between place in our planetary system. "You know in the end it doesn't really matter if it's called a dwarf planet or a planet or an asteroid. We want to understand it," Raymond says. Astronomers think Ceres is a remnant from the earliest days of the solar system. 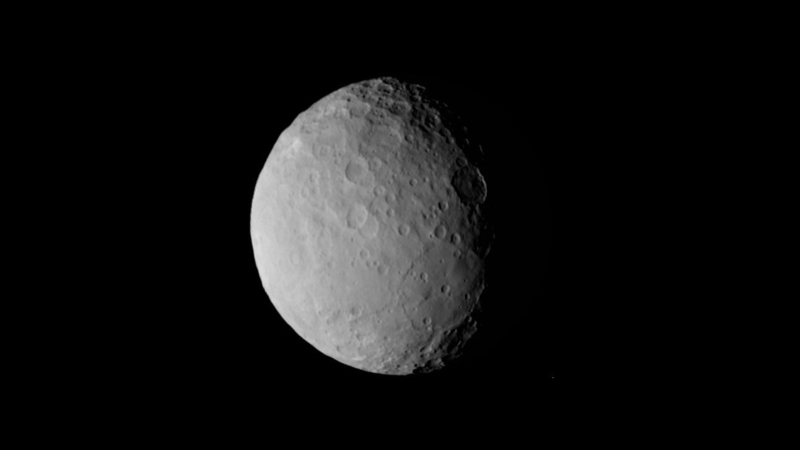 Ceres was gradually becoming larger, as its gravity pulled in dust and rock. But nearby Jupiter's gravity sent space rocks scattering and stopped Ceres from growing past its present size. Even before it arrived, Dawn provided astronomers plenty to look at. In February, it detected two bright spots on Ceres. Some scientists believe they could be ice volcanoes, though Raymond thinks the most likely explanation is salt. Dawn won't be landing on the dwarf planet, but will stay in its orbit. Raymond says the long wait to get to Ceres means there will be some celebrating today. "I think champagne might be nice," she says. But not too much, because there's a lot of work to be done in order to learn how Ceres fits into our solar system.